•	Machine Rated for continuous operation. •	Higher Output with Process Uniformity. •	Range of SS Perforated or Wire Knitted Screen Available. •	Different Size of Screen/ Speed/ Number of Blade/ direction of rotation of Blade can be selected. •	Unique 360 degree Screen for Higher Output. •	Additional Perforation Screen at the Bottom of Pulverizing Chamber to eliminate Higher Percentage of Fineness & control Granule Size more effectively and Obtain Higher Outputs. 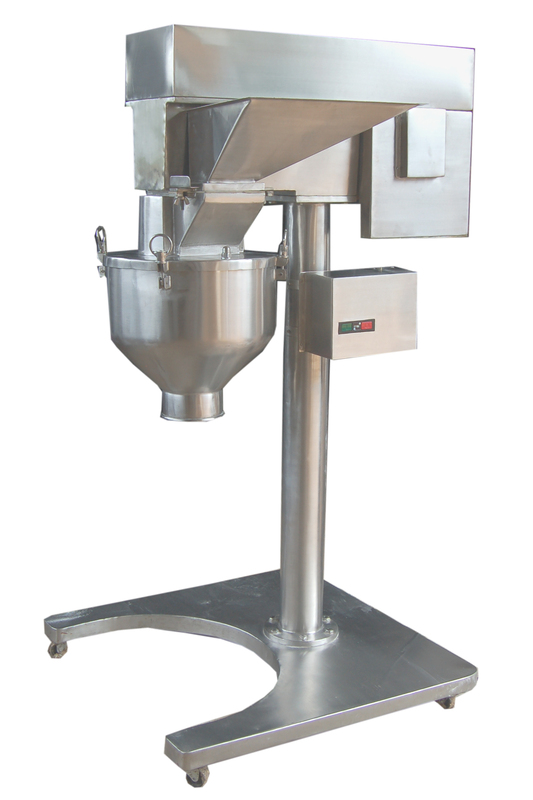 •	No expensive dust collection system required when used for pulverizing. •	All Contact parts of SS304 AISI/ SS316AISI. •	All Parts can be Easily Dismantled for Cleaning, Washing & Validation*. •	AC Variable drive for stepless speed controls*. * Optional, Lab Model is Available Request. MOtor 3HP, 1440RPM, 440V, 3Ph. Standard Speeds 750/1500/2000/3000 RPM (RPM Control by VFD in Direct Drive). Blades 12 Swing Blades with Knife Edges & Impect Edge, 2 Scrapper Blades to avoid settling of Material inside Granuation Chember. Screen Sizes Perforation Screen in Wide range from 0.5mm dia. upto 25mm Dia. Hole.